Has your former husband not paid his share of last year’s joint taxes? If so, then in spite of paying your share of taxes on time, your refund amount can be at stake. Not to worry as by submitting injured spouse form you can earn your benefits. Well, there are several types of Injured Spouse Form Samples as templates available in our collection like Medical Forms. 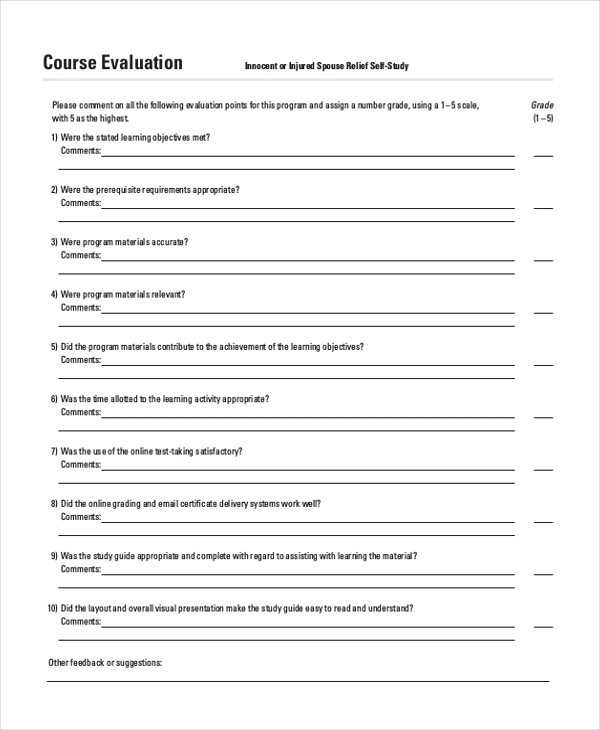 The Injured Spouse Form template options are as follows. For partner’s failure in paying for his/her share of joint taxes for earning tax benefits. 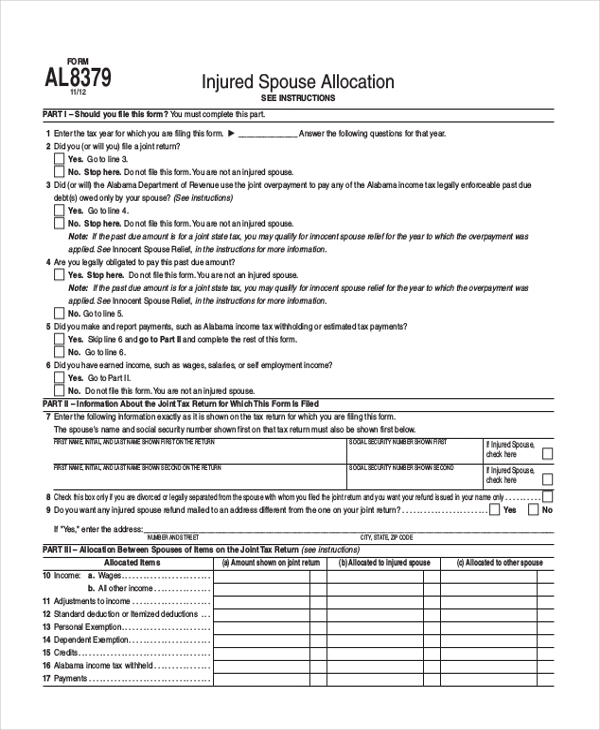 You can download, customize and fill up this Injured spouse form sample template, and claim your refund amount. 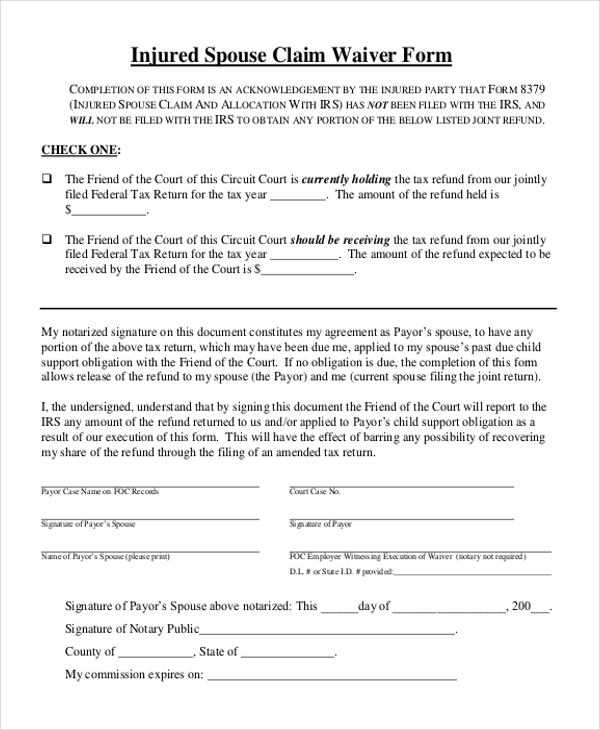 Have you been filing a joint tax return with your partner, and if you had encountered failure in tax payment, you can still earn the refund by opting for injured spouse allocation form template. Download, customize and print for use. 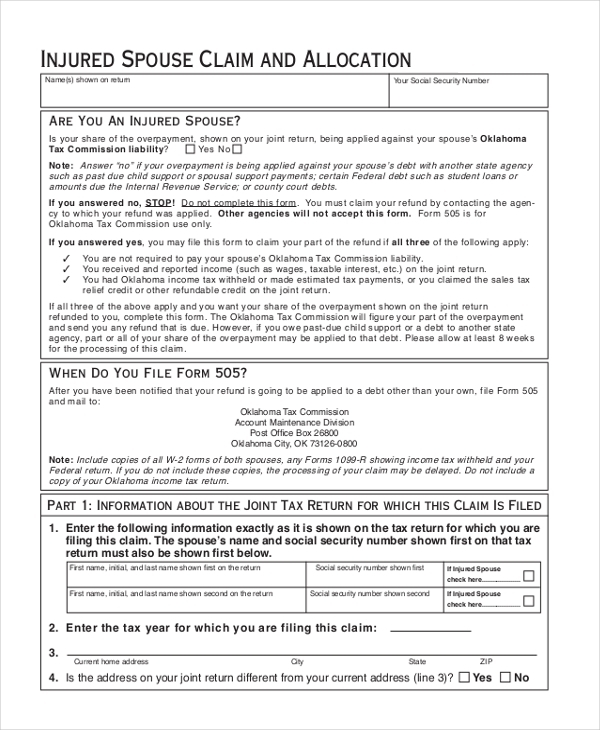 For joint tax return filers, if a failure in paying tax happens from your partner’s side, simply download this injured spouse claim form, print it out and use it to get your share of the refund. If you want to waive the charges for non-payment of taxes, because of your partner’s negligence in paying the taxes regarding joint tax returns. Just download this template, print, and use. For getting your share of tax benefits in joint tax filing, in spite of non-payment of taxes by your partner, you can download this injured spouse tax return form, fill it up and claim your refund amount. If your partner has caused tax liability in your joint tax filing procedure, by downloading this innocent or injured spouse relief self-study form, you can submit and claim your share of refund money. This standard injured spouse claim and allocation form is a must download if you want to get your share of tax benefits as returns, in spite of non-payment of taxes from your partner’s side. For obtaining spouse relief scheme in earning tax benefits, in spite of the failure of joint tax payments by your partner, you can download this form, customize it and then print it for use. 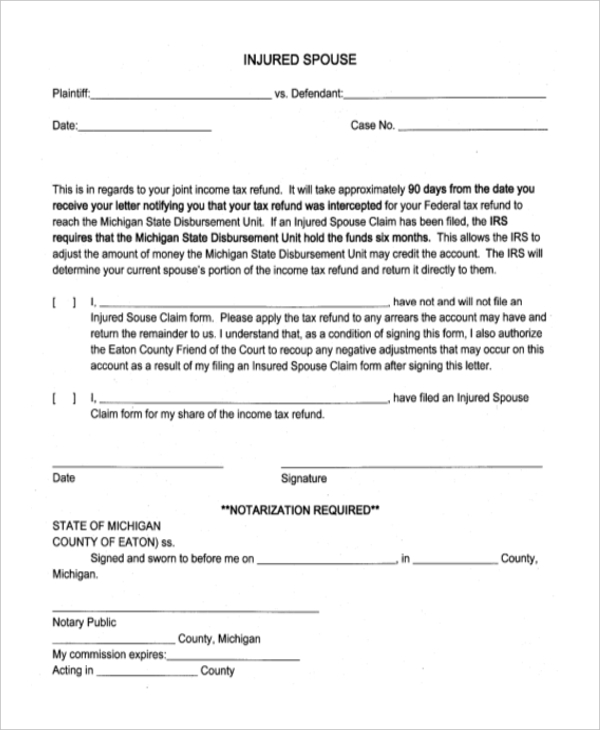 Injured spouse tax claim can be obtained if you download this injured spouse form template. By downloading, printing and filling it up you can get your tax refund. It doesn’t matter if yours paid his share. In the case of obligation caused due to tax payment, joint tax filers who are spouses are both made responsible for this negligence. But, if you are very much particular, and you pay your share of taxes in time without any delay, then you won’t like to suffer from any delay in getting tax return benefits. If your spouse is to be blamed for any tax liability, then you can claim for injured spouse act. By filling up an injured spouse form and submitting it to the government authority can save you and get you, your share of the refund amount. The templates in our collection have been designed as these injuries spouse form samples. You may also see Medical History Forms. Whether you are a divorcee or you and your partner are still connected through matrimony, in the case of joint tax filing procedure, both of you should always pay the government taxes on time, in order to get tax refund benefits. For non-payment of any federal taxes by partners may stop you from getting any kind of tax benefits. At that time You can submit the injured spouse form and make yourself clear to the government about your payment on time. 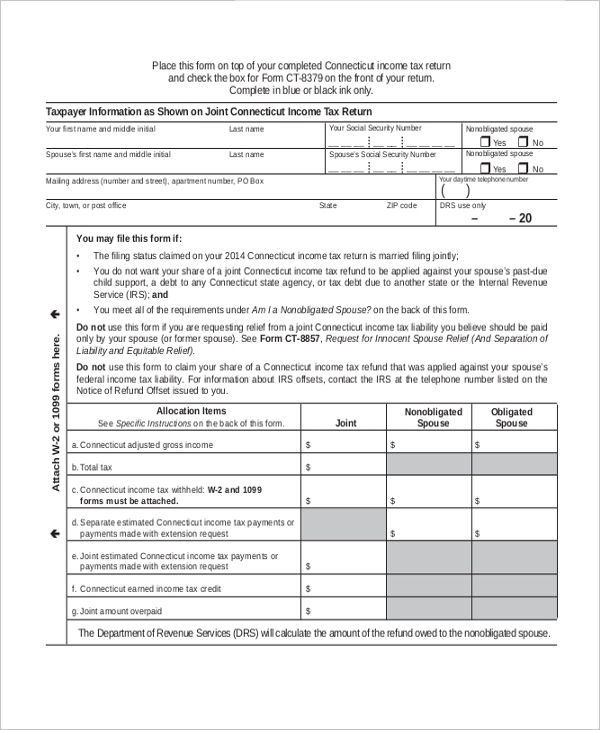 Download these templates available in various options on injured spouse form, print, fill up and use for claiming your share of tax refund benefits. You can also see Medical Consent Forms. 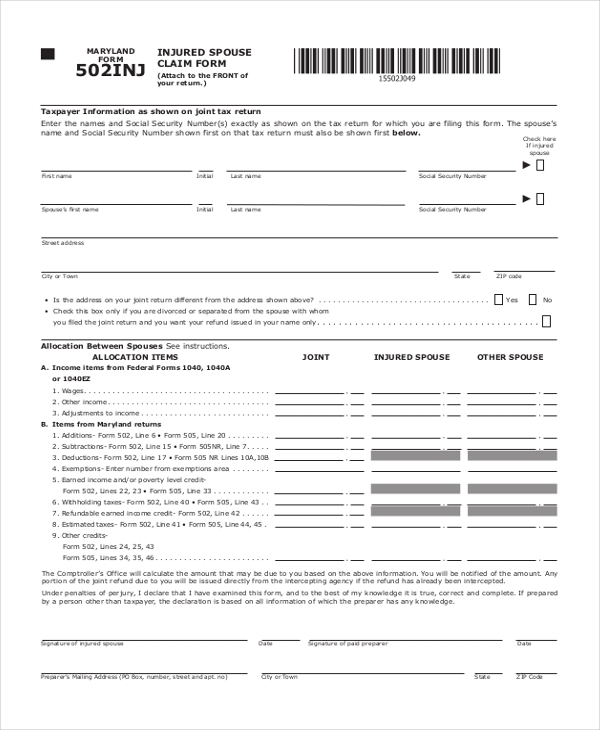 Browse through our collection of various Injured Spouse Form Sample templates just like Medical Waiver Forms. 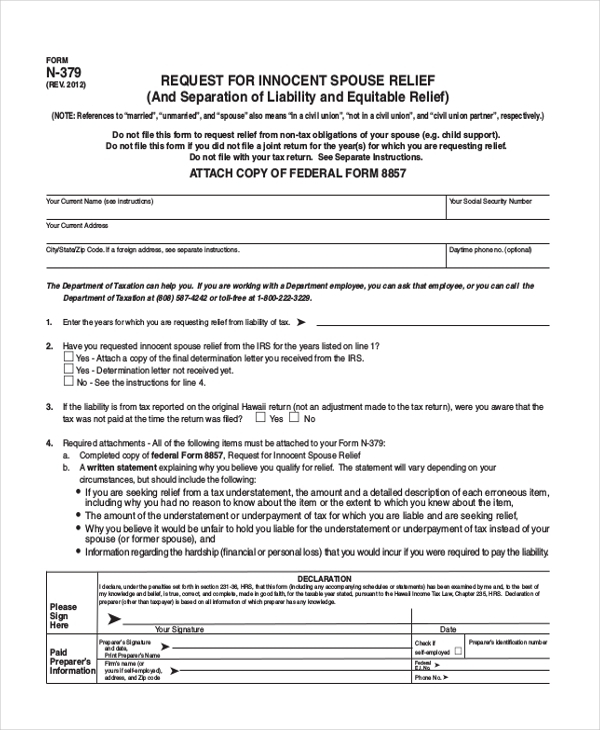 Download them and use these templates when you want to surrender under injured spouse act. 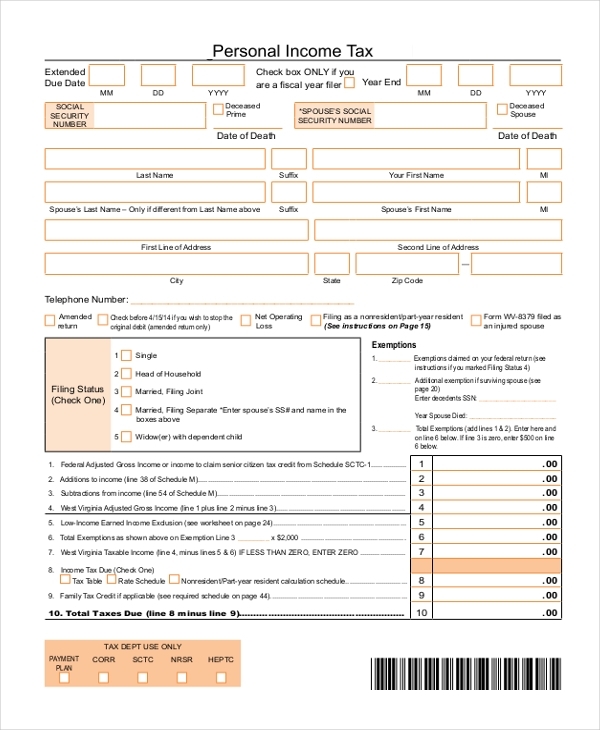 These templates are also 100% print ready, you can take the printout and use these forms to get yourself the tax refund money for which you have paid.